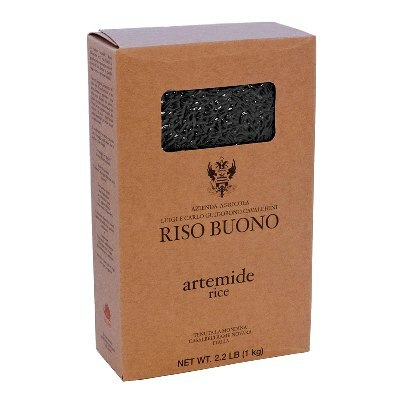 A unique hybrid long grain rice, this box of Artemide Black rice is from the Riso Buono farm. From the Piedmont region, it is a crossbreed of Indica and Venus rice. It is rich in essential minerals such as iron and silicon, which has amazing antioxidant properties. This dark rice has an intense and somewhat pleasant fragrance when you cook it. It is excellent for risotto dishes with vegetables, mushrooms, or cheese. It may also be great with seafood ingredients. It may also be perfect for creamy sauces such as those with butter sage, gorgonzola cheese, or squash. To cook, simply boil it with salted water for about 35 minutes. Once done, drain the water and add any of ingredients above or serve it with your preferred sauce.